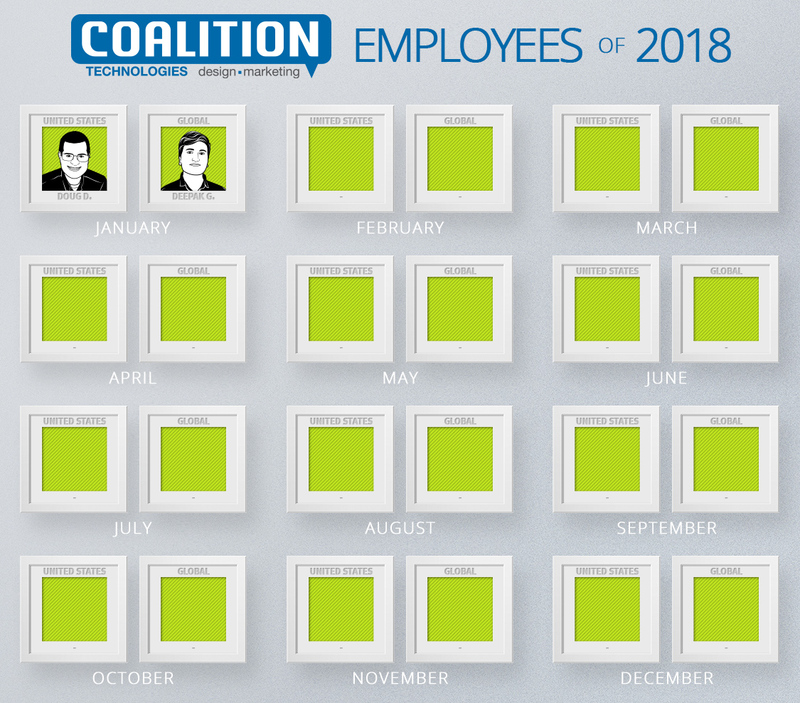 Here at Coalition Technologies, we take pride in the fact that we hire only the best and the brightest – and it shows. Our success speaks to the amazing employees we’ve compiled. 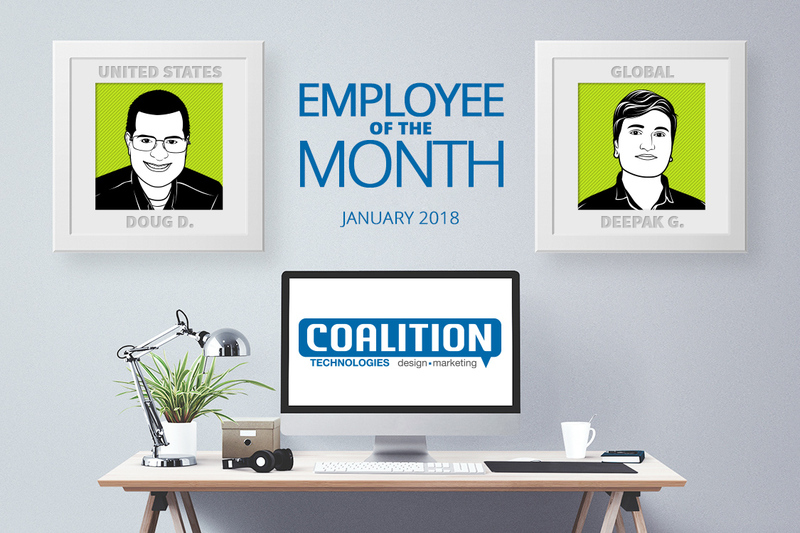 This month, we’re pleased to honor two employees who have worked so hard to make Coalition as awesome as it is: Doug Drenkow and Deepak Garg. Read on to learn what makes these two such banner coworkers! Doug started in June of 2017 as a Digital Strategist, acting as a trusted consultant to our prospective clients. He works to custom-make a strategy to fit each potential client’s needs and budget, as well as introducing our team to new clients. He works with all kinds of industries, and is always intrigued to learn about all the different businesses that are out there! January was an amazing month for Doug, and he achieved the highest sales ever recorded by a Coalition team member! When interviewed about his success in January, Doug referenced that his success could not have come without the support of the team he has here at Coalition. In his spare time, Doug likes to go to Knott’s Berry Farm with his wife, Frances, and hanging out at home with his fur baby, Pierre the cat. Deepak is an SEO Technician, and started with us in July of 2017. He works to find linkbuilding opportunities for our clients, as well as completing technical SEO fixes for many different clients. He serves a lot of different industries – everything from car modification parts, luxury watches, luxury apparel, and footwear. He’s proud of his work as an SEO tech, and counts his biggest success as being able to complete all of his client’s primary goals each month, which is no easy feat! Deepak enjoys being an integral part of the Coalition team, and likes how supportive his team leads are. When he’s not fixing up a client’s site, Deepak enjoys travelling whenever he can, learning more about different places all over. Keep an Eye Out for February! We’d be nowhere as successful without fantastic team members like Doug and Deepak! We appreciate the hard work they, and every one of our coworkers, put in throughout the year. We’re so lucky to be a part of this team! Thank you everyone for everything you do to make Coalition such a great place to work. Be sure to keep an eye out for February’s employees of the month!